The Kaman UH-2 Seasprite is a ship-based naval helicopter produced by the Kaman Aircraft Corporation. The first production models were delivered in 1967, following the first prototype flight in 1967. The Seasprite is the product of a design competition held by the US Navy in 1956. The original design called for a fast, ship-based utility helicopter, but in the 1970s anti-submarine capabilities were added to the base design in response to increased threat from enemy submarines. Surface threat capability was also included in these design changes, including the “over the horizon” targeting ability. UH-2s modified in this way were designated as SH-2. This helicopter helps to extend the sensor range of its base ship, acting as the eyes and ears of the vessel, spotting a variety of threats that would otherwise be detected too late or not at all. 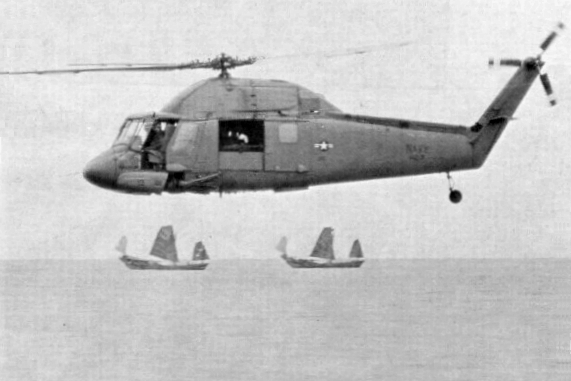 These helicopters were however used for a variety of roles, such as casualty transport, evacuation, gunnery observation, recon and supply drops. The Seasprite featured a single-engine design, using a 1250 shaft horsepower GE T58-GE-8B turboshaft engine. However, 40 UH-2 variants were modified to accommodate two engines, doubling their power. This is a significant improvement for the safety and reliability of an overwater craft as well, which is exactly where the Seasprite operated most often. This upgrade enabled those units to hit an airspeed of 130 knots and a range of 411 nautical miles. The Seasprite has a long and proud operational history. The US Navy operated a fleet of over 200 units. It was in service to the US Navy from the 1960s until 2001, when the last units were retired. In the 1990s many surplus Seasprite were offered to foreign nations as a form of aid. Although countries such as Greece and Turkey said “no thank you”, many such as Egypt and Poland, were happy to take the agreeing helicopters for repurposing. Thanks for sharing your nice story, Stan! Do you want to comment the Kaman UH-2 Seasprite helicopter?